Following in the phenomenal success of Candy Crush Saga, King produced another interesting sequel in the Candy Crush franchise, Candy Crush Soda Saga! The game has plenty of challenging match-3 puzzles from various types of modes that are, as usual, filled the much-hated blockers. There are also the same old boosters that you can use, such as the Lollipop Hammer, to help yourself out from a tough level in game. In all honesty, it is not much different from the original and yet, the small amount of differences in the new game drastically changes how you play the game! It is no wonder King has been hailed as one of the best match-3 puzzle creators of all time! If you've played the original game and had loved it, then this is definitely one game that you simply couldn't miss out! It’s always sunny in Candy Town, but Mr Yeti is not happy and feels very lonely since Tiffi is gone. However, Tiffi has always sent letters to cheer him up, and then all of that suddenly stopped. Why Tiffi’s letters stopped coming? Join Mr Yeti as he journeys across various outlandish and candy-filled landscapes, asking the inhabitants for information and trying to piece together what has happened. 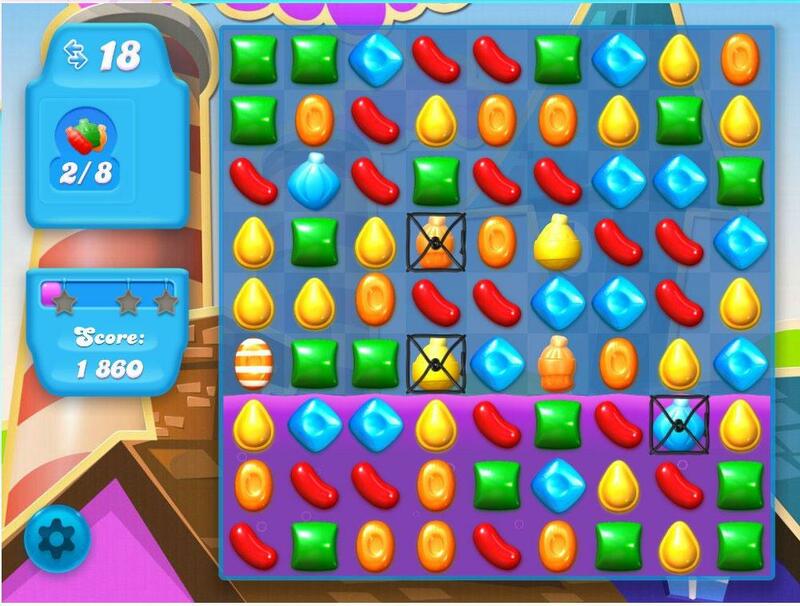 The gameplay is fairly similar to the original and to every other match-3 game out there – you just need to match at least 3 candies of the same color by swapping. A 4- candy match will get you a bonus striped candy that can clear an entire row or column of candies while a 5-candy match will earn you a chocolate ball (something like a Ferrero Roche, but with sprinkles instead of chunks of nuts), which can remove candies that have the same color as the one you swapped it with. There are also wrapped candies, which you can get if you can perform an L-shaped or T-shaped 3-candy match. These candies explode when swapped in the game. Furthermore, each game provides you with a limited number of moves. However, there are some really interesting twists introduced in Candy Crush Soda Saga that made it such a unique game. It is definitely not just ‘another’ Candy Crush! The first distinctive thing you’ll notice is the new level goals. Once you start the game, you’ll encounter the first level which requires you to perform matches that include the soda bottles in order increase the soda level on the board. Sounds easy? Not really, here’s something else that may just blow your mind! You know how the new candies drop down from the top of the board, as they usually do, right? However, for the part of the board, which is swamped with purple bubbling soda, this rule is reversed! The new candies will float up to the top of the soda level instead! 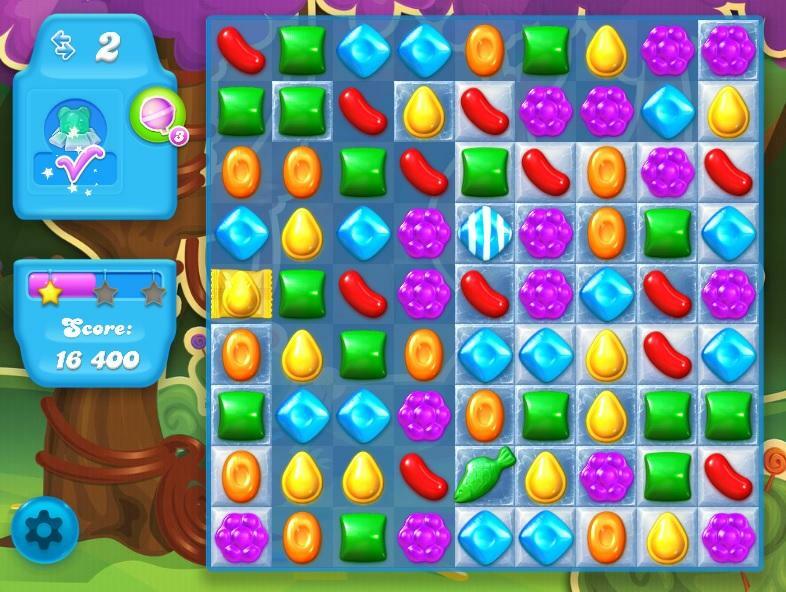 So, as you play, you will probably end up having half the board with new candies dropping down from the top and the other half with new candies floating up from the bottom. Mind blown yet? 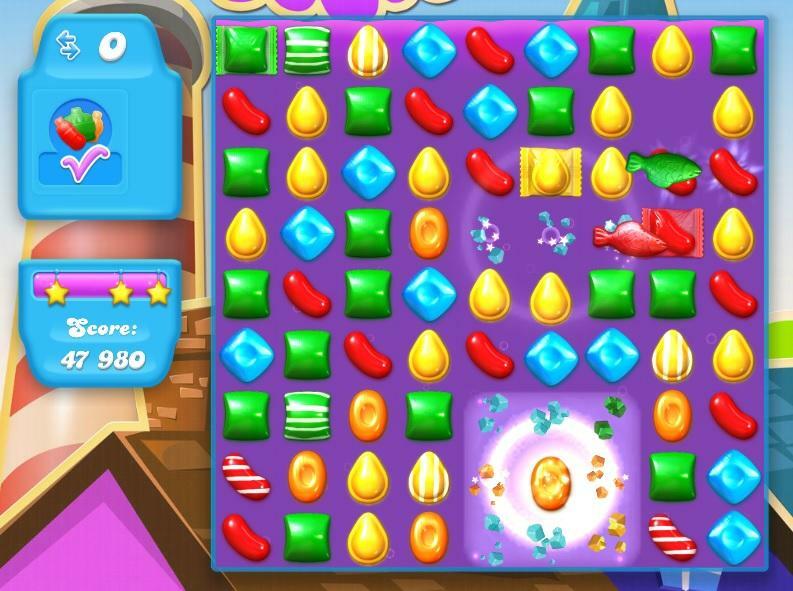 There are a whole new army of blockers in Candy Crush Soda Saga. They include liquorice lock and different layered cupcakes. To break these, you will either need to perform matches with the candy that are locked by liquorice or perform multiple matches adjacent to the cupcakes. After clearing a few of those basic levels, you’ll encounter your first new level type – find the bears! Now, the game adds in frosting and, of course, gummy bears. These poor bears are trapped underneath the ice sheets and you’ll have to find and free them by completing matches to break the ice. You will start off with 1-layered ice sheets whereby you can easily see-through and identify which places the bears are trapped at. However, there are multiple layers of ice sheets that you’ll meet and, not to mention, the dreaded blockers as well! Some gummy bears can also grow up to very huge sizes and that will require even more matches to save them. Crazy, huh? At level 10, you’ll come face-to-face with the third level type in this Candy Crush Soda Saga, the ‘get the bear above the candy string’ or, in short, the bubble level. In this level type, the gummy bears (it seems like they are getting into all sort of troubles in this game) are now trapped in a bubbles. What you will need do to is make matches above the bubble to gently float the gummy bear above the candy string line and to freedom! There’s a catch though – in order to let it float to the top, you will need to immerse the part of the board leading up to the candy string in soda! So, this level practically uses the first level type and added some other elements to the game to make it into your third level type. Moreover, when several types of blockers are thrown into the mix, you’ll definitely have one hell of a time trying to solve the level. Do you remember those meddlesome chocolates in the old Candy Crush game? Well, they made a comeback in Candy Crush Soda Saga! Thought you are free from them, eh? These chocolates are the scourge of every candy crusher! They multiple like crazy even while you are trying to break them up. 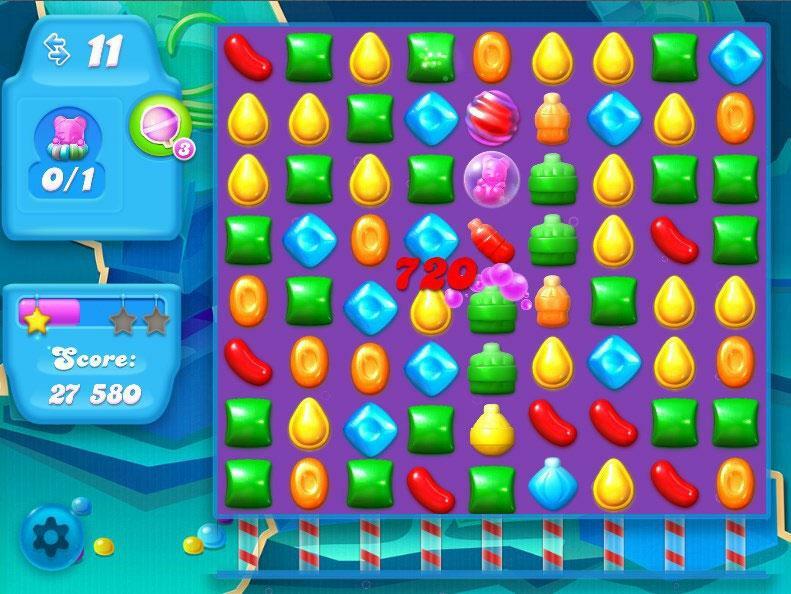 They are one of the toughest levels in Candy Crush Soda Saga and it gets even harder as you progress to above level 120 - the chocolate will turn white and become layered. So, yeah, ‘urgh’ is the right expression for this. The last level type is, introduced at level 76, is the honey levels. This time the gummy bears are trapped in honey! Similarly to the second level type, you will have to free these poor victimized bears by matching and breaking the blocks of honey. There is also a bubble gum level later on. However, do note that due to their extreme stickiness, honey and bubble gum are way much harder to break than frosting. Besides different level types, the game introduces several new special candies as well! By creating a 4-candy, square-shaped match, you’ll earn a jelly fish (not ‘jellyfish’ mind you). These jelly fishes are very intelligent and seem to know, most of the time, which tile on the board they should be targeting. 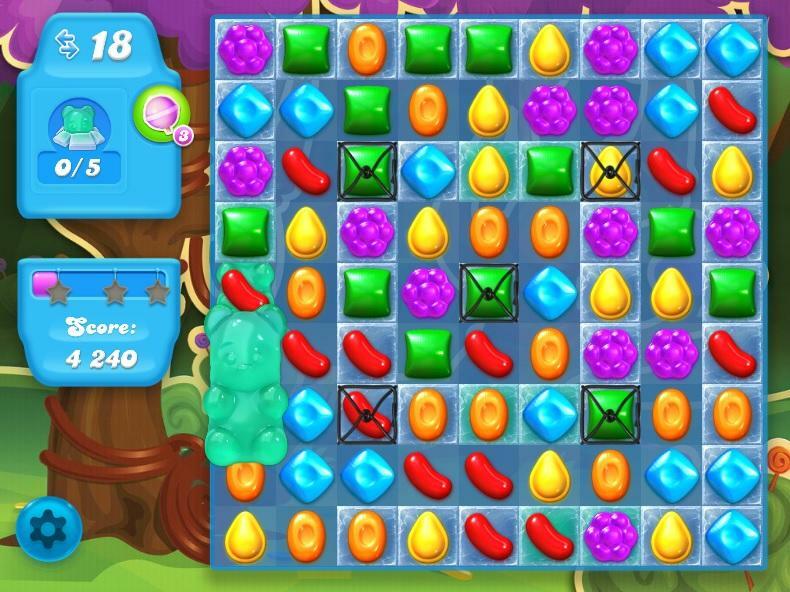 For instance, there’s a level whereby there are 2 candies that are isolated from the main board. 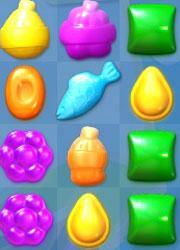 These little fishes seem to know to target these candies to help you complete the level. You can also combine these fishes with other special candies, for example, the striped candy, and they will function like a messenger and carry the striped candy to the other, separate board and activate it. It’s amazing! Furthermore, Candy Crush Soda Saga also introduces a rare special candy, the coloring candy, which you can only get by getting a 7-candy match… hence, the word ‘rare’. It works in a way that is somewhat similar to the chocolate ball, except that it changes the color of the candy that you swapped it with, along with all other candies with the same color, to the color of the coloring candy. It’s really tricky to explain, how about an example then? Okay, let’s just say that you have a green coloring candy and you swapped it with a normal blue candy. All blue candy in the board will then be color-changed to green. It’s simpler to understand if you put it that way, right? Coloring candies are extremely hard to pull off though and you mostly get it from the accidental chain of matches, if you’re lucky enough, that is. Boosters, like the lollipop hammer, made a comeback too in this game. You are given 3 free boosters of each type and if you ran out of them, you can spend some money to buy more. If you somehow managed to beat the game with plenty of moves to spare, the game will activate Soda Crush. 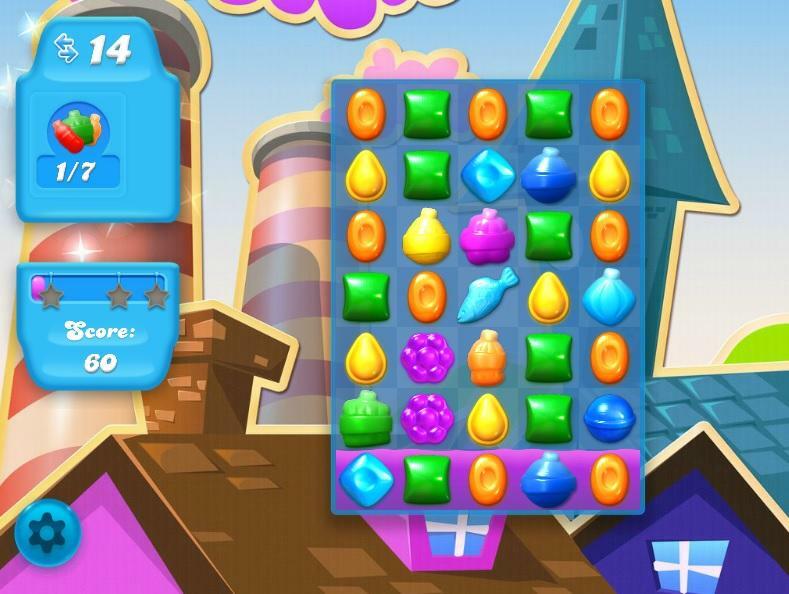 It is similar to Candy Crush in the original game, whereby the game will randomly turn your candies into special candies and these special candies will be automatically used up. In brief, you end up with even more points! Every extra point, no matter how little they are, is very valuable as the game compares your score with the scores of all your friends for every level. Surely, you wouldn’t want to lose out to your friend on the leaderboard! Another feature that was brought over from Candy Crush Saga is the life system. You are given a maximum of 5 lives that will be lost, one at a time, whenever you failed any level in the game. On the bright side, these lives will regenerate slowly over time. If you cannot wait, you could always spend some real money or pester your many Facebook friends for more lives… whichever way that works for you! Candy Crush Soda Saga may not have as much popularity as its predecessor… yet, but it is getting there with time! There are around 1.6 million likes on its Facebook fan page, less than 1 year since its release (8 months to be exact)! That’s an amazing 2 hundred thousand likes per month! Most importantly is how closely connected its community is. They add each other on the Facebook fan page in order to gift each other lives. There are also plenty of people who are willing to give you a hand to solve that particularly tough level by offering advice, such as where you can get the video walkthrough for that level. 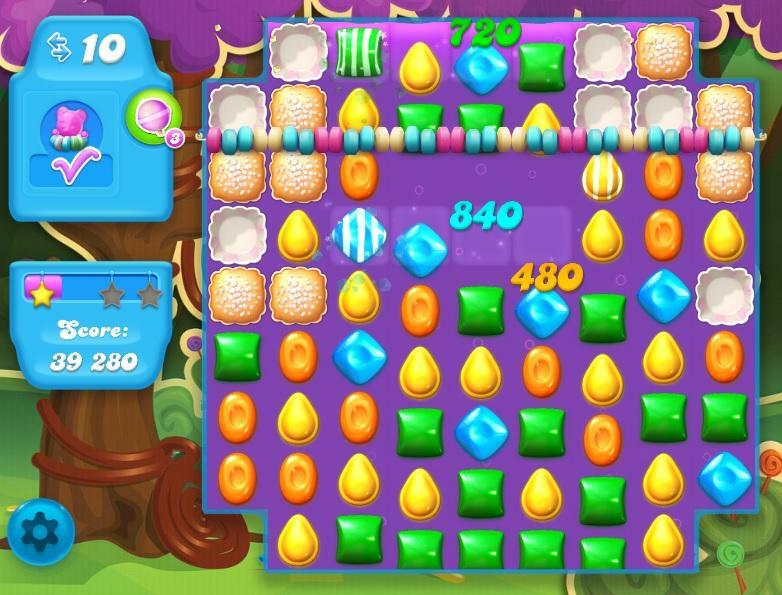 The graphics in Candy Crush Soda Saga is designed to provide an overall sense of fizzing fun! Every candy in the game is vibrantly colorful, perfectly fitting the theme of the game. Many of the cute cartoon characters from Candy Crush Saga return to this new series as well. The whole experience is nothing short of amazing! The music in this game is of high quality indeed! King, the developing company, commissioned the renowned London Symphony Orchestra to compose and create the sound in the game. This include the very Disney-like music you hear at the level selection screen. There are also constant positive vocal feedbacks, such as “Juicy” or “Sodalicious”, to keep you playing the game! 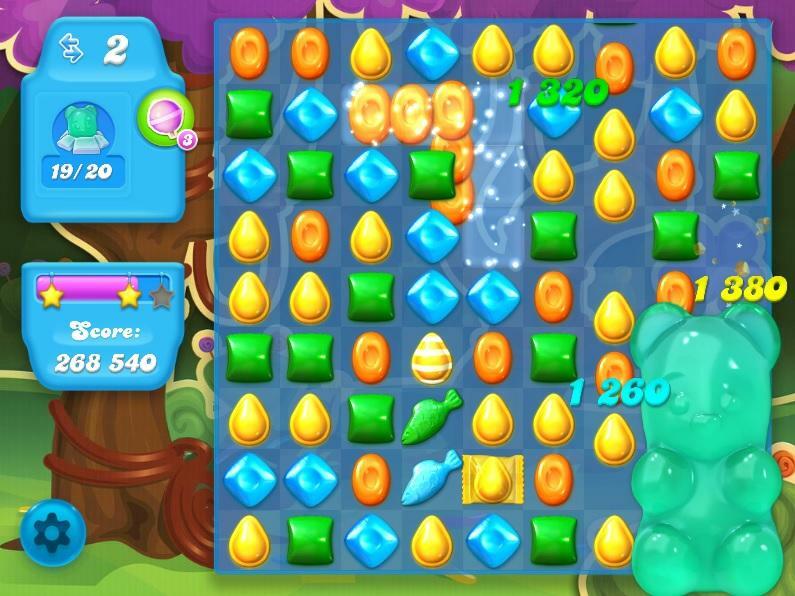 In short, Candy Crush Soda Saga is a great sequel to the legendary match-3 puzzle series. It brings with it a whole lot of special and new features in addition to the familiar gameplay. 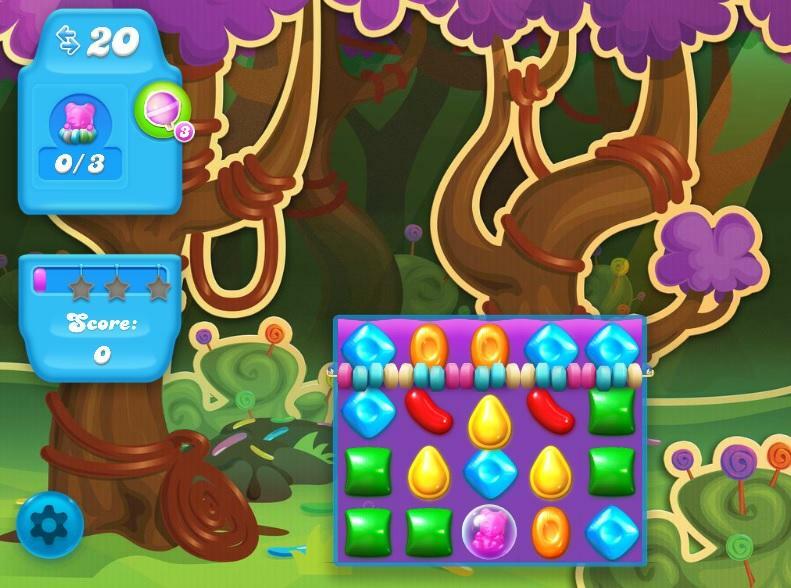 The game still emphasizes more on strategy, in which every move you make matters and not how fast you can match the candies, and on achieving the game objectives. Since the game has probably taken over your Facebook newsfeed, why not join the masses and hop into the magical purple Soda today! God know, your brain could use the workout! by Aethyna Jan 12, 2015 With a whole range of new levels to explore, with new challenges and candies there is a lot for you to do in this latest addition to the Candy Crush Family. With updated graphics, all the boosters you love plus a few new tricks come in and see this amazing new game. Read More Be the First to Post a Review!